In a study of this replacement heart valve, which is inserted into the aorta with a catheter, patients were less likely to die or have a stroke than those who underwent surgery. Promising new studies on a type of artificial heart valve could pave the way for it to be used in many more patients, allowing them to avoid the rigors of open-heart surgery. Compared with those who underwent surgery, patients who got the device were less likely to die or suffer a stroke after the procedure, researchers announced Sunday at a meeting of the American College of Cardiology in New Orleans. One of the studies, whose authors included surgeons from Penn Medicine and the Lankenau Heart Institute at Main Line Health, has followed its patients for one year. The other, in which patients received a replacement valve made by a different manufacturer, has lasted for two years. In both cases, the goal was to treat a condition called aortic stenosis, in which the heart valve that transmits oxygenated blood to the body becomes narrow and stiff with calcium deposits — causing shortness of breath and fainting in severe cases. Surgery to fix the problem involves cracking open the patient’s chest or making smaller cuts through the ribs, then implanting a replacement valve. Full recovery takes weeks, sometimes months. The newer alternative involves using a slender catheter to insert a replacement valve through an artery in the groin, typically enabling the patient to go home the next day. At a glance, the second option — a transcatheter aortic valve replacement (TAVR) — would seem to be a no-brainer. But before approving it, government regulators required evidence that it worked at least as well. Among the questions: was the TAVR valve, which is expanded to full size after being inserted with a catheter, as durable as the kind used in traditional surgery? The catheter option initially was approved by the U.S. Food and Drug Administration in 2011 for patients who were too frail or sick for surgery. The pool of patients eligible for TAVR later was expanded to include those who were at high or intermediate risk for surgery. The latest studies suggest that TAVR is a good bet for patients who are at low risk for surgery. In the study to which Penn and Lankenau contributed, 8.5 percent of people whose valves were replaced via catheter died, had a stroke, or went back to the hospital within one year, compared with 15.1 percent of patients who had the valve replaced with open-heart surgery. In a separate analysis, the researchers tallied the number of deaths or “disabling” strokes, finding that they occurred in just 1 percent of catheter patients but in 2.9 percent of those who had surgery. Patients who received the valve via catheter were more likely to suffer mild leakage around the device, but that issue did not appear to cause complications. 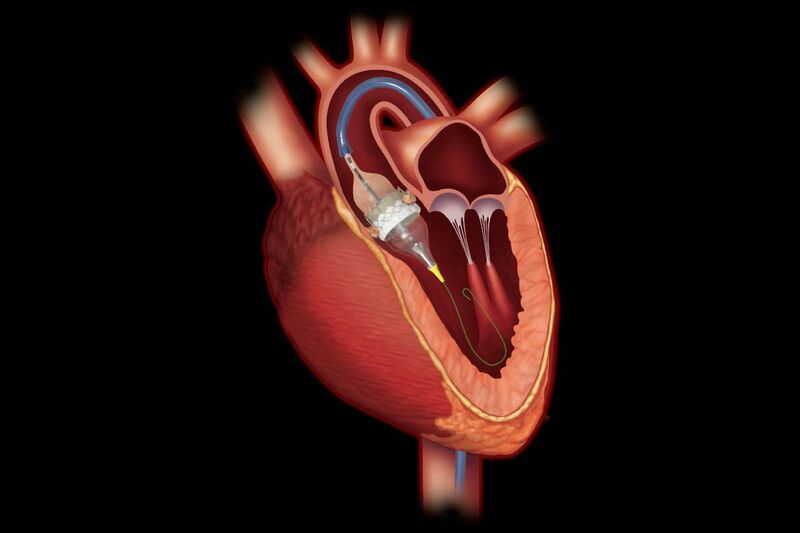 The TAVR valve in that study is called the Sapien 3, made by Edwards Lifesciences of Irvine, Calif. In the other study, 5.3 percent of TAVR patients died or suffered a disabling stroke within two years, compared with 6.7 percent of those who had surgery. The TAVR valve in that study is called the Evolut, made by Medtronic Inc., which has its main offices in Minneapolis, Minn. and Dublin, Ireland. Both study teams will continue to follow their patients. Scott M. Goldman, a co-author of the first study and director of the structural heart program at Lankenau, said he was not surprised that TAVR patients fared so well. In addition to the lower rate of death or stroke, such patients also are less likely to suffer infection and other complications because they spend such a short time in the hospital, he said. A key to the good outcomes with TAVR is the teamwork between heart surgeons and cardiologists, said co-author Wilson Szeto, a professor at the University of Pennsylvania’s Perelman School of Medicine. But he cautioned that more research is needed. “It is only one year, and longer followup will be needed before we’re completely sure,” Szeto said. The study results will give ammunition to the manufacturers when they seek approval for their devices to be implanted in the broader pool of low-risk patients. TAVRs already are implanted 45,000 times a year in higher-risk patients at more than 600 hospitals, according to James Laskaris, a senior clinical analyst at MD Buyline. Medicare pays $38,500 to $49,500 for the combination of the device and the fees to the hospital and physicians, said Laskaris, whose firm is a subsidiary of Dallas-based TractManager, a purchasing and contract manager for hospitals. The amount varies based on the health of the patient. Reimbursements to private insurers tend to be higher. For hospitals that perform fewer than 50 TAVR procedures a year, the procedure is at best a break-even proposition, Laskaris said. But many institutions feel the need to have it on their menu of services to be considered a full-fledged heart program. Hospitals that perform more than 100 TAVRs a year can come out ahead through higher efficiency and purchasing the necessary supplies in volume, Laskaris said. Penn Medicine performs about 500 of the procedures each year, Szeto said. Lankenau performs about 230, Goldman said.